Earlier this fall there were predictions that this winter would be colder than average, and with the exception of a few mild days I’d have to agree with that prediction. It’s now mid-February, and while the days are getting a bit longer each day, spring still seems a long way away. Nothing beats the cold like warm comfort food, and since January 28 the Stouffer’s Mac ‘N’ Cheese Truck has been making the rounds in Manhattan with Master of Spice Lior Lev Sercarz and Southern “Grill Girl” Elizabeth Karmel and six other famed New York chefs serving locals Stouffer’s Macaroni & Cheese for $4 per bowl. 100% of profits from the truck went to the Mayor’s Fund to Advance New York City in support of Hurricane Sandy relief efforts. 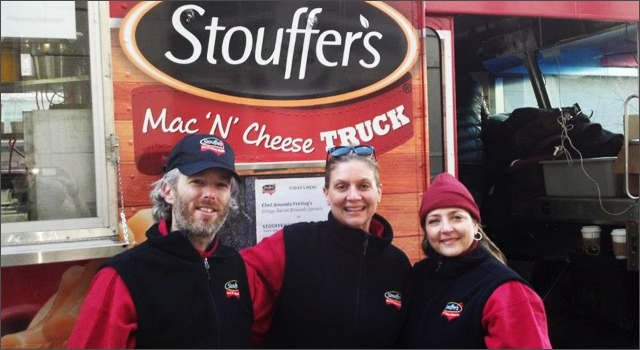 The campaign, which raised a total of $35,000 for Hurricane Sandy relief over 3 weeks, wrapped up on Valentine’s Day with the Stouffer’s delivering free mac ‘n’ cheese meals to chilly Manhattanites who tweeted the hashtag #localwarming.